Custom printed notepads and notebooks make perfect items to bring awareness to your brand or event and make great giveaways. These products are fully customizable with various sizes and number of sheets available per notepad and notebook. These useful items can be personalized with your logo and business info, monogram, watermark, lines and grids. 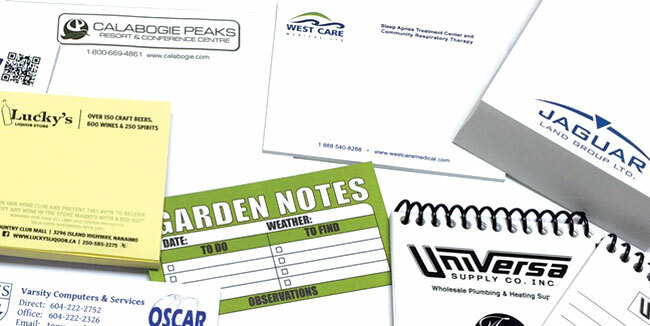 Popular notepad uses are weekly planners, prescriptions, thank you’s, mailers, referrals, realtor and sales giveaways. Magnetic backs and waterproof notepads also available. Minimum order is 25 units. Available with 25, 50 or 100 sheets per pad with a backer card added to each memo pad. Glued at the narrow edge. Contact us for a quote on custom sizes. 2 1/2″ x 2 1/2″ • 3″ x 3″ • 3 1/2″ x 31/2″ with 100, 200 or 300 sheets per notepad with a backer card added to each scratch pad. Glued at the top edge. Custom printed in 1 colour to full colour (CMYK) on white, 20lb bond paper. Various paper colours & 100% recycled paper available at an extra charge, please contact us for a quote. Made on site at our Vancouver, BC location. Custom printed notebooks are impressive products that can be personalized with your logo, company info, rules, grids and tables. Notebooks make great gifts and giveaways at seminars, training sessions and trade shows. Other uses include: work books, report books, journals and perpetual calendars. Minimum order is 25 units. Notebook sizes include: 3 1/4″ x 5 1/4″ (small pocket size) • 5″ x 8″ • 8″ x 10″ with 25, 50 or 100 sheets per book with coil (spiral) binding on the narrow edge. Contact us for a quote on different sizes, binding on the long edge, carbonless paper, wire O binding and stapled notebooks. Front and back covers are printed one side on white glossy 120lb card stock in black or full colour (CMYK). Inside sheets are custom printed two sides in black on white, 20lb bond paper. Customized waterproof notebooks also available, contact us for a quote. Made on site at our Vancouver, BC location. Custom printed note cubes are effective and valuable desktop promotional products that people use everyday. Popular sizes include: 2 1/2″ cube • 3″ cube • 3 1/2″ cube. Half cubes also available. Minimum order is 50 units. Contact us for a quote. Made on site at our Vancouver, BC location. Popular sticky notepad sizes include: 3 1/2″ x 2″ • 3″ x 3″ • 4″ x 3″ • 4″ x 6″ • 5″ x 3″ • 5″ x 8″ with 25, 50 or 100 sheets per pad. First dimension is adhesive edge. Minimum order is 60 units. Contact us for a quotation. We also provide design services, please contact us for a quote. Visit our Resources page for ideas from our Collection of Designs and Fonts. Production time for notepads, cubes and notebooks is 7 to 10 working days. Time will vary for large orders. These note products are stacked in boxes with packing paper. Visit our stickers, pocket mirrors, fridge magnets and keychains pages. Also, take a look at our Idea Guide, which provides popular promotional products for various industries and events. We deliver to individuals and businesses across Canada daily, small towns to large cities. We have accounts with a number of local and leading couriers including FedEx, Purolator, UPS, Canpar and Canada Post. So delivering to Victoria, Edmonton, Calgary, Regina, Winnipeg, Montreal, Toronto or Halifax is no problem. We can also take care of your shipping needs to the USA. Contact us for a shipping quote.